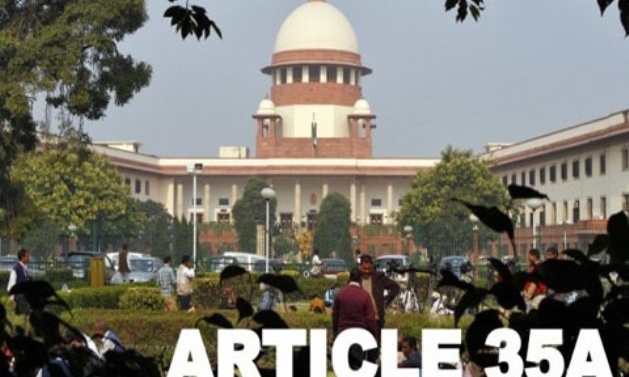 A five-member civil society coordination committee on Thursday said that numerous Jammu-based organisations were on the same page as Kashmir for safeguarding Article 35-A in the interest of Jammu and Kashmir. Addressing a press conference here, members of ‘We the People of Jammu and Kashmir’ said that they met civil society, business groups and other organisations in Jammu as part of the second leg of its campaign to safeguard Article 35-A. Mufti Nasir-ul-Islam said that almost a dozen groups in Jammu have been convinced for protecting the special status of the state. “The groups we met are against dividing the state on the lines of religion and region. They don’t want any tinkering with Article 35A. These organizations include Gaw Raksha Committee, Dogra Saddar Sabha Jammu, Jammu Muslim Front, Jammu Chamber of Commerce and Industries and others,” Mufti Nasir said. Awami National Conference chief Muzaffar Ahmad Shah said the Jammu campaign has helped the civil society group to meet like-minded people on the issue of Article 35-A. He said that the civil society group will be expanded and will even include representation from PaK. “We are also working to include members from Pakistan-administered Kashmir as well. This organisation will be apolitical and work for issues which confront the state and people,” Shah said.